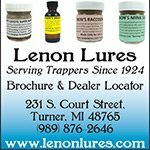 Welcome to our raccoon trapping guide filled with useful information and techniques to help you successfully trap a raccoon. A majority of people are interested in trapping a raccoon for one of two reasons....You're either targeting them for their valuable fur or they're a nuisance pest that's invading your home or nearby building. Raccoons are a curious animal. This curiosity or mischievous behavior often causes a conflict with homeowners. Once a raccoon finds an easy meal in your garbage it will be back again....and again....and again. Lets face it, you can only clean up garbage for so long until you decide something needs to change. To keep things simple, we broke this guide up into two different sections. 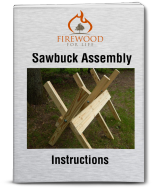 One section to help homeowners remove a nuisance raccoon on their own without calling an expensive pest control expert, and another section that deals with trapping raccoons as a furbearer. A raccoon invades your yard or home searching for two basic things.....food and/or shelter. To learn more about the raccoon including their behavior, food preferences and overall lifestyle read this article on raccoon facts. Let's say you have an animal that's getting into your cat food every night or ripping open garbage bags leaving behind a huge mess. How do you know what animal is doing it? One easy way to determine if it's a raccoon is to look at the tracks left behind. Read here to learn about and identify raccoon tracks. Once you've determined you have a raccoon problem you basically have two choices....remove it yourself or call a professional. If you're a do-it-yourself type person you can learn a lot in this article about raccoon removal from an attic, chimney, barn or other structure near your home. Just because you have a raccoon in your garbage it doesn't mean it's living in your house. In fact, it's probably living somewhere nearby in a hollow tree and it just walks to your house every night for food. 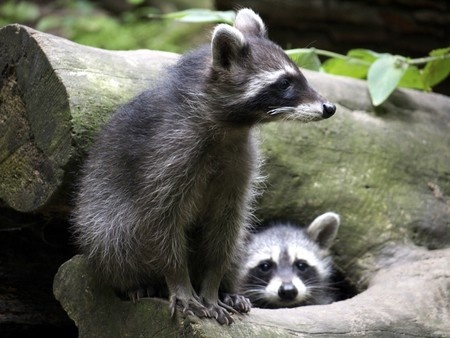 Read here to learn how to trap raccoons that are just coming around for an easy meal. 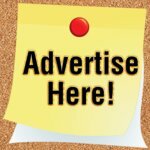 Or you can read this article that explains how to get rid of raccoons that are invading your bird feeders. A live trap is the most popular trap used by homeowners and professionals to trap a nuisance raccoon from your home or property. Read here to learn the best raccoon bait to use in a live trap. If you're not a trapper and would rather use a repellant to deter the raccoons from your yard or home read this article about raccoon repellant to learn if they work and how to make your own homemade version. It's important to remember that raccoons are known to carry different diseases that could make you sick. To learn more, read this article on raccoon disease. Do raccoons hibernate? Read here to find out! If there's one animal I love to trap it's a raccoon. They're abundant, not very trap shy and you can trap them using a few basic sets. To start, let's look at the different types of raccoon traps and determine which ones are the best choice for you. If you find a river, stream or marsh chances are there's a raccoon nearby. Raccoons love to travel waterways in search of food. 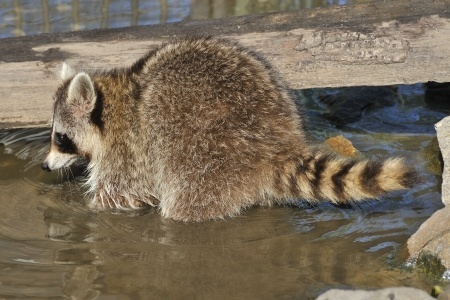 Read here to learn about water trapping raccoons using a pocket set. 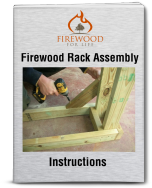 Raccoon Bucket Set - Learn how to use a bucket and a 160 or 220 conibear to make a set that works great in a variety of different locations. Raccoon PVC Pipe Set - Use a piece of PVC pipe to construct a great water set or dry land set that raccoons can't resist. Raccoon Smear Set - A great set to use at culverts and bridges that have vertical cement structures. Dog Proof Raccoon Set - Learn how to use a dog proof trap to reduce the possibility of catching a non-targeted animal. After you successfully trap a raccoon the next step is to prepare the pelt. This article contains step by step instructions to teach you how to skin a raccoon. Whether you're trapping a raccoon for their fur or because they're causing chaos around your home, a raccoon is an easy animal to trap and anyone can do it!